As well as having a wealth of happy, domestic customers here at Great Grass, we also deal commercially as artificial grass suppliers of trade artificial grass; working with a number of landscapers and gardeners. We know a lot of landscapers and gardeners get frustrated with unreliable artificial grass suppliers and wholesalers, especially if they’re freelance or self-employed. From fluctuating prices to hit and miss quality, it can be incredibly difficult to do business in trade artificial grass. Luckily, we’ve built up a stellar reputation as artificial grass suppliers in trade artificial grass. We’ve got some solid relationships and have even got our own database of people we regularly supply to. Some of our artificial grass customers often ask us if we know any landscapers or gardeners that we could recommend. Whilst we always make it clear that we are no way affiliated with certain individuals and that they do not work for Great Grass, we have no problem passing on details of the people we have supplied to. You could be added to the list! We offer fantastic trade discounts. We have an honest and transparent culture. A designated Great Grass Commercial team member will handle every aspect of your order process. 99.9% of the time everything runs perfectly, but life isn’t perfect and we promise to rectify any problems that occur as quickly as possible. You won’t find better quality trade artificial grass for a better price! Our distribution team is fantastic, allowing us to deliver most orders the very next day! We can deliver anywhere in the UK in less than 24 hours and even ship internationally. Building a long lasting relationship that benefits both parties is part of our culture. Great Grass comes highly recommended by our previous clients who include Manchester City Football Club, Silverstone Racecourse, Chester Race Course and many more! 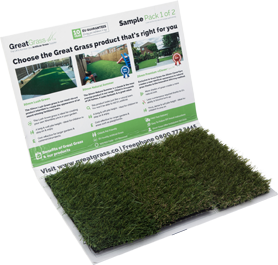 I think that’s settled then; Great Grass is your first point of call for artificial grass suppliers of trade artificial grass!